Jeg har flere faglige interesseområder. Moderne japansk litteratur/kultur/popkultur, og kultur- og samfunnsutvikling i dagens Japan herunder kvinnestilling. Tekst- og kontekstbasert litteratur- og kulturanalyse er mitt hovedkompetanseområde, men jeg har også publisert artikler om kvinnes stilling og eldreomsorg i Japan fra et komparativt samfunnsvitenskapelig perspektiv. Bachelor-emne i japansk litteraturhistorie, Master-emne i moderne japansk litteratur samt språkundervisning/tekstlesing i japansk 1, 2 og 4. Sōseki Centenary. Ten essays in English on Natsume Sōseki, and translations of five Japanese Essays. Selected and edited with Alan Tansman and Keith Vincent, forthcoming from The Review of Japanese Culture and Society in 2017. Sekai no Sōseki (Sōseki in the World). Ten essays in Japanese on Natsume Sōseki, Selected and edited with Alan Tansman and Keith Vincent, forthcoming from Iwanami shoten in 2016. Japan Forteller. Ed. Oslo: De Norske Bokklubbene 1994. 506 s.
Auestad, Reiko Abe (2018). "Colliding forms in literary history: A reading of Natsume Sôseki's Light and Dark", In May Hawas (ed. ), The Routledge Companion to World Literature and World History. Routledge. ISBN 978-1138921658. Chapter 25. Auestad, Reiko Abe (2017). "Ibuse Masuji's Kuroi Ame (Black Rain 1965) and Imamura Shohei's Film Adaptation, Kuroi Ame (Black Rain 1989)". Bunron - Journal of Japanese Literary Studies. ISSN 2199-2754. 4 Fulltekst i vitenarkiv. Auestad, Reiko Abe (2015). "Ipusen to Sôseki: romanchikkurabu ideorogî to ren'ai no yukue" (From Ibsen to Sôseki: in the shadow of romantic love ideology), I: Norio Okazawa (red. ), Hokuoo gaku no furontia. Minerva Shobou. ISBN 4-623-07200-2. "Ipusen to Sôseki: romanchikkurabu ideorogi to ren'ai no yukue". 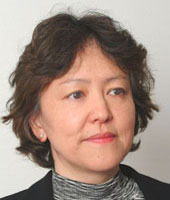 Auestad, Reiko Abe (2009). "Kobayashi Takiji, Strindberg's Miss Julie, and the Realist View of the Body", In Takiji no shiten kara mita Shintai, Chiiki, Kyoiku. Otaru Commercial University Press. ISBN 9784877383619. Artikkel. Auestad, Reiko Abe (2002). "Reading Modern Japanese Literature as a Critical Project: The Case of Dazai Osamu's Autobiographical Novel, Tsugaru", In Michel Hockx & Ivo Smits (ed. ), Reading East Asian Writing: Essays on Literature, Theory, China and Japan. Curzon Press, London. Auestad, Reiko Abe (2001). "Kenkyû nôto: Hokuô (noruwee) ni okeru nihon kindai bungaku kenkyû" (Research Notes: 'Modern Japanese Literature' in Scandinavia: Norway). Nihon kindai bungaku (Modern Japanese Literature). ISSN 0549-3749. Auestad, Reiko Abe (2001). "Discourse in the Japanese Novel: 'Dialogic' Social Exchanges in Natsume Soseki's Meian", In Jeffery Johnson (ed. ), Essays on Bakhtinian Theory in the Field of Japanese Studies. Edwin Mellom Press, Lewiston, Queenston, and Lampeter, U.S.A..
Auestad, Reiko Abe (2001). "The Movement of kaiki in Eto Jun", In Yoichi Nagashima (ed. ), Return to Japan: From "Pilgrimage" to the West. University of Aarhus Press. Gjennom skildring av Abe Yoshishige«s forhold til sin mentor, Natsume Soseki, fokuserer artikkelen p¿ hvordan "taisho kyohyo shugi" har bidratt til ¿ diktere hvordan moderne litteratur skal leses. Auestad, Reiko Abe (1998). "Ogino Anna and parodic language". Japan forum. ISSN 0955-5803. Auestad, Reiko Abe (1996). "The Lady of Eguchi: Profane or Sacred? ", In Bjarke Frellesvig & Christian Hermansen (ed. ), Florilegium Japonicum. Akademisk Forlag. Auestad, Reiko Abe (1996). "Ôe Kenzaburô og etterkrigstidens Japan". Kritikkjournalen. ISSN 0801-0471. Auestad, Reiko Abe (1993). "Some Feminist Reflections on Natsume Sôseki's Kôjin (The Wayfarer)", In Acta Universitatis Tamperensis: Selected Contributions from Third Nordic Symposium on Japanese and Korean Studies. University of Tempera, Finland. Auestad, Reiko Abe; Tørring, Magne & Kaminka, Ika (red.) (2018). Knakketiknakk. Korte fortellinger fra Japan 1895-2012. Bokvennen forlag. ISBN 978-82-7488-779-4. 644 s.
Auestad, Reiko Abe (2016). Rereading Sôseki: Three Early Twentieth Century Novels. Council on East Asian Studies at Yale University. ISBN 978-0-9912509-3-6. Auestad, Reiko Abe; Saito, Yayoi; Wærness, Kari & Wærness, Kari E (2010). Meeting the Challenges of Elder Care: Japan and Norway. Kyoto University Press. ISBN 978-4-87698-938-6. 210 s.
Auestad, Reiko Abe (2004). Noruwee no shakai (Norwegian Society). Waseda University Press. ISBN 4-657-04928-3. 225 s.
Auestad, Reiko Abe (1998). Rereading Soseki: Three Early Twentieth-Century Japanese Novels. Harrassowitz Verlag. ISBN 3-447-04122-6. 208 s.
Auestad, Reiko Abe (red.) (1994). Japan Forteller. De Norske Bokklubbene. ISBN 82-525-2987-9. 506 s.
Auestad, Reiko Abe (2018). "Seven years after the 3.11: Rethinking the human-nonhuman continuum in Tawada Yôko's Emissary (Kentoshi 2014)". Auestad, Reiko Abe (2017). "Abe Yoshishige on Masaoka Shiki as a Person". Auestad, Reiko Abe (2017). "Between Monogatari and the Novel: Genji, Nakgami Kenji and Sôseki". Auestad, Reiko Abe (2017). "Natsume Sôseki botsugo hyakunen ni Sôseki o kataru" (Soseki on the centenary of his death). Auestad, Reiko Abe (2017). "Sôseki's Narrative Experiments: FID, Shaseibun and Dialogues". Auestad, Reiko Abe (2016). “Affect, Natsume Sôseki and World Literature.” Keynote Lecture..
Auestad, Reiko Abe (2016). “Ibuse Masuji’s Kuroi Ame (Black Rain 1965) and Imamura Shôhei’s Filmatization (1989)”. Auestad, Reiko Abe (2016). "The 1989 Filmatization of Ibuse Masuji’s Kuroi Ame (Black Rain 1966) by Imamura Shohei”. Auestad, Reiko Abe (2015). "Kawakami Mieko's Chichi to ran (breasts and eggs): Negative Feelings in Circulation". Auestad, Reiko Abe (2015). "Murakami Haruki, World Literature and Kafka on the Shore". Auestad, Reiko Abe (2014). "Affect that disorients 'Kokoro'". Auestad, Reiko Abe (2014). "Murakami Haruki, Sauejakten og globalisering av litteratur". Auestad, Reiko Abe (2013). "Murakami Haruki, world literature, and Kafka on the Shore". Auestad, Reiko Abe (2013). "Positionality, affect and performance in Soseki's Kokoro". Auestad, Reiko Abe & Tørring, Magne (2013). Oversatt aften: japansk litteratur i Norge nå. Auestad, Reiko Abe (2012). “Between history and heritage: forests and mountains as a figurative space for revitalizing the past in Ôe Kenzaburô’works". Auestad, Reiko Abe (2011). “Bunka no honyaku to shite no kantekisutosei: Ito Hiromi no Nihon no fushigi na hanashi" (Intertextuality as a form of Cultural Translation: Ito Hiromi's Mysterious Tales of Japan). Auestad, Reiko Abe (2011). Toge nuki jizoo engi (On 'Toge nuki jizoo engi, 2008' by Ito Hiromi). Auestad, Reiko Abe (2010). “Hypertextuality / intertextuality as a Form of ‘Cultural Translation’: Akutagawa Ryûnosuke’s ‘In a Grove’ and Itō Hiromi’s ‘Mysterious Tales of Japan". Auestad, Reiko Abe & Kaminka, Ika (2010). Duell: Hvor japansk er Murakami?. Auestad, Reiko Abe (2009). “Kirino Natsuo's Grotesque: Epistle, Memoir and Diary as Narrative Instruments”. Auestad, Reiko Abe; Tørring, Magne & Kaminka, Ika (2009). Litteratur på Blå: Haruki Murakami. Auestad, Reiko Abe (2008). Kobayashi Takiji, Strindberg's Miss Julie, and the Realist View of the "Body". Auestad, Reiko Abe (2005). "How to tell a true war story: representation of history in Murakami Haruki's Wind up bird-chronicle". Auestad, Reiko Abe (2005). "Implicatoins of Globalization on the Reception of Modern Japanese Literature: Murakami Haruki". Auestad, Reiko Abe (2005). "Noruwee no kyôiku seido" (Educaiton system in Norway). Auestad, Reiko Abe (2005). "Noruwee/Hokuô no bunka to gengo" (Culture and Language in Norway/Scandinavia). Auestad, Reiko Abe (2004). "The new social insurance for the care of the elderly in Japan: Is it a departure or continuaiton of the Japanese welfare model?". Auestad, Reiko Abe (2003). "Reading Soseki like Ibsen: The Drama That Can Be Re-performed," part of the panel, "The Actuality of Natsume Soseki in 2004". Auestad, Reiko Abe (2003). "The Japanese New Woman in the early twentieth century: Mineko in Soseki's Sanshiro," part of the panel session, "Cashing in on Soseki: Modern Japanese Literature, Critical Reception, and the State". Auestad, Reiko Abe (2002). "Missing Links in Dazai Osamu's Autobiographical Novels". Auestad, Reiko Abe (2001). "Familien i Japan: Drømmens sendebud". Auestad, Reiko Abe (2001). "Reading History in Modern Japanese Literature: Natsume Soseki and Oe Kenzaburo". Auestad, Reiko Abe (2000). �Reading Modern Japanese Literature as a Critical Project�. Auestad, Reiko Abe (1998). "Natsume Soseki's Meian". Auestad, Reiko Abe (1997). "Dazai Osamu's Female Monologues (onna gatari)". Auestad, Reiko Abe (1995). "Ogino Anna and Yoshimoto Banana: Two cases of Postmodern writing". Auestad, Reiko Abe (1995). "The Bad Faith Mechanism and a Rhetorical Language in Botchan". Auestad, Reiko Abe (1995). "Natsume Sôseki's Kôjin (The Wayfarer) and Meian (Light and Darkness) Reconsidered: Textual Analysis with Emphasis on Native Constraints". Auestad, Reiko Abe (1994). "Between Ogino Anna's Dancer from the Snow Country and the Lady of Eguchi". Auestad, Reiko Abe (1993). "Murakami Haruki's Sauejakten". Morgenbladet. ISSN 0805-3847. Auestad, Reiko Abe (1993). "Narratological Structure and Style in a Japanese Novel: Soseki's Meian". Auestad, Reiko Abe (1993). "The Critical Reception of Soseki's Kojin and Meian".